I dream of traveling. The kind of traveling that is spontaneous. The kind of traveling that could last for days to weeks. One day when our son is in college and my husband and I have retired… that is the kind of traveling we will do. Until then, we will be content with our 1-2 trips a year. We have done enough traveling that I’m in need of some new luggage. I have been making frequent trips to visit my family this year, so my luggage is starting to show some wear and tear. I was looking at some of the great pieces at Atlantic Luggage this morning, and found just what I was looking for – something versatile, lightweight and affordable. 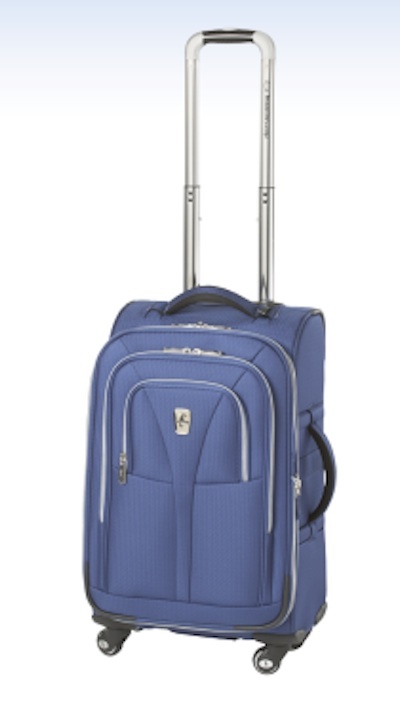 The Compass®Unite Debut® is the perfect luggage for us. I love the Compass Unite because it’s…. Lightweight – Compass Unite has a patent pending technology called Link2Go™ that allows you to attach two pieces of luggage together, so you can roll the luggage as if it were one piece. Affordable – Compass Unite is priced with families in mind. You won’t break the bank spending money on luggage… they want you to save your money for your travels. If you want reliable luggage that will last for years and not break down on you during your travels, you will definitely get your money’s worth with Compass Unite. If your a fashion conscious female who wants it all — style, function, quality, and value… Compass Unite is the way to go. 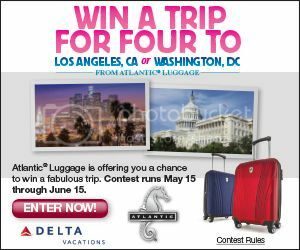 That’s right, you can win a family trip for 4 in the Atlantic Luggage Sweepstakes! One lucky person could win a family vacation (for 4) to the destination of their choosing, either Los Angeles, CA or Washington, DC!!! Trip includes airfare, hotel, $300 activity allowance, and 4-pieces of Atlantic luggage. I sure hope one of YOU win. Go enter and Good luck! I am definitely up for a vacation and I would go to any of those destinations. ooh either of these places would be a great travel experience for the fam. I too would love to travel the world… India, Nepal, Vietnam, Cambodia, Bali, all of the islands… My girls travel to the South of France every summer to visit my parents. I go as much as I can and new luggage would be more than welcome! Very cool! My favorite is WDW with my family. This looks like good luggage!! I’m going to check them out. OOH!! I’d definitely go to Washington DC if we won! Awesome contest! I really need to get a new carryon, the handle on mine was broken when it got checked during one of my recent trips. Soo cool!! Love the luggage! This luggage would be great for our summer trips. Great luggage! We would like to take the kids to DC if we won! Wow, their luggage looks quite sleek and sturdy! I think my favorite vacations are the ones to my home town to visit my Dad. I get to see old school friends and spend time with my dad. What could be better?! My husband and I once drove across country for 10 days from Illinois to California. Best vacation ever! I would totally love to win this! My luggage is 13 years old! What a great prize! That looks like some great luggage, too! We have about 6 pieces of atlantic luggage and the freaking cats keep peeing on it!!!!!!!!!! I love this bag by Atlantic Luggage. I want it for my trip next month. We go to the Wisconsin Dells every summer and we are in need of new luggage! Our favorite vacation is Disney World or the beach. Either place and I’m a very happy girl! I like the look of this bag. My husband seems to think the swivel casters are impractical but I’d have to try it out to be sure. Anything is better than the beat up old hodgepodge of bags we have now. I think our last trip to Yosemite was fantastic and we seriously need to do it again. I would use this luggage for our upcoming honeymoon. It would be perfect.